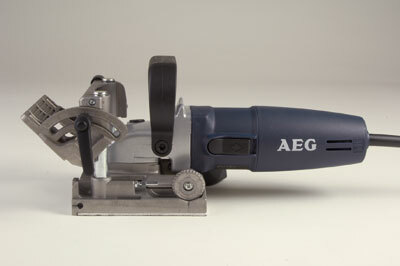 Having last used AEG's biscuit jointer some years ago I was eager to try out its current incarnation. The body is tough plastic in a restrained dark blue livery, bright silver-finished aluminium gear housing, and etched gunmetal-grey aluminium baseplate and fence. All casting work is very clean and neatly defined - even scales and numbers are moulded into the castings. The loop grab handle is big and comfortable and can be tilted a little or removed if required. The on-off switch is pulled back to switch and lock on. Tip: I found that using the side of my finger to operate it was more comfortable than the usual fingertip. 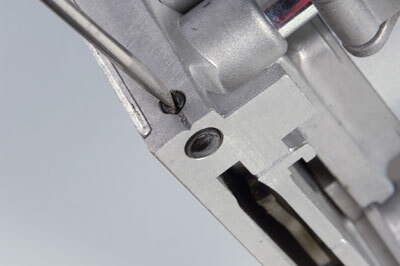 Plunge action is by means of what appear to be two stainless steel strips fitted to the underside of the gear housing and rubbing in two grooves in the baseplate casting. This arrangement avoids two aluminium surfaces contacting directly, causing 'wiping' where the metal grain binds together resulting in wear, sticking and a grey sludge that can spoil work. All better-quality jointers normally incorporate solutions to this problem. In fact the LF650 came unlubricated on these slides and needed a touch of WD40 to slide and snap back easily. Six depth plunge settings are made using a revolving wheel acting against an adjustable pin behind one of the chromed fence slide columns. Three grooves on the baseplate and blade housing help position the slots. Cunning little rubber-faced anti-slip pads are moved in or out as required with the twist of a screwdriver; however one pad threatened to fall off, as it is simply a self-adhesive type, so care is needed to keep them in place. 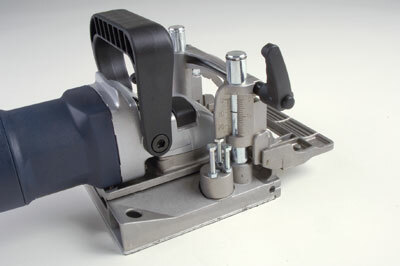 The fall front/fence is set by two Bristol levers: one is for angle movement up to 90 degrees locking against a protractor scale and the other is for height, using a blade-shaped projection on the rear of the casting which acts against an optional three-pin, adjustable turret for repeatable settings. A metric scale is also provided for height setting against a fine grooved ring on one of the chrome slide columns. Blade changing is achieved by unscrewing the aluminium baseplate to expose the six-tooth anti-kickback-pattern TCT blade. Once the spindle lock is depressed on the gear housing, the supplied pin spanner is applied to undo the nut for blade replacement. 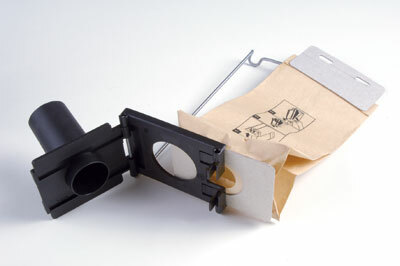 Extraction options are threefold: firstly, a curved spout to eject waste away from the operator; secondly, interchanging with a snap-fit straight pipe for linking to an auto extractor unit; and thirdly, a natty wire-frame dustbag arrangement which is supplied, along with three dustbags. The plastic parts hinge open to release and fit a new bag, which hooks on to the rear of the wire frame. All controls are easy to operate, including the on-off switch which has a very positive action. This is a nice machine to carry around and operate. Motor and gear noise are about standard for a biscuit jointer - ear defenders are best for long runs of work though. With the fence set at 90 degrees, the blade-to-fence distance is a somewhat challenged 30mm; the maximum blade projection of 19mm is OK but not excessive - this would be the maximum setting for sawing or grooving as opposed to joint cutting. Motor power is perfectly adequate for the job it is intended to do. 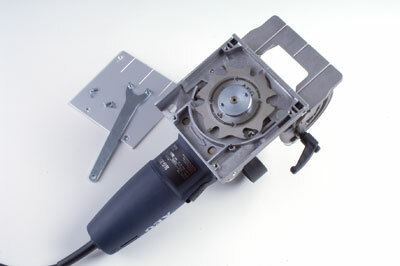 A clip-on 4mm thickness plate is supplied to make working with different-thickness materials easier. The whole kit comes in a sturdy moulded site case. 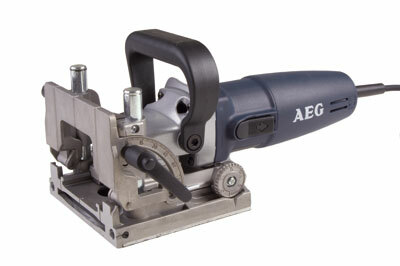 The AEG LF650 biscuit jointer is a well turned out, refined piece of kit with several clever features, capable of demanding and accurate work. It is only let down by the short fence columns, thus limiting the fence-to-blade distance - although operator ingenuity will find solutions. 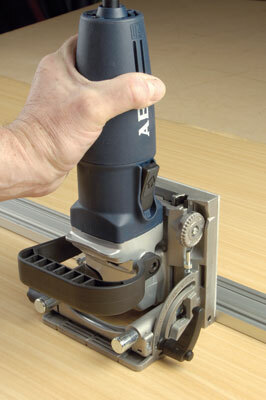 "The AEG LF650 biscuit jointer is a well turned out, refined piece of kit"